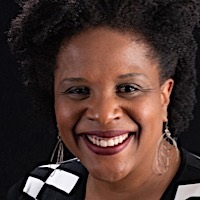 Tayari Jones is the author of the novels Leaving Atlanta (2009), The Untelling (2007), Silver Sparrow (2012), and An American Marriage (2018). Her writing has appeared in Tin House, the Believer, the New York Times, and Callaloo. A professor of creative writing at Emory University, she is also a member of the Fellowship of Southern Writers. In addition, she has received the Hurston/Wright Legacy Award, the Lifetime Achievement Award in Fine Arts from the Congressional Black Caucus Foundation, a United States Artist Fellowship, an NEA Fellowship, and a Radcliffe Institute Bunting Fellowship. The NEA added Silver Sparrow to its Big Read Library of classics in 2016. Jones is a graduate of Spelman College, the University of Iowa, and Arizona State University. Her newest novel, An American Marriage (a 2018 Oprah's Book Club selection), tells the story of newlyweds Celestial and Roy, whose marriage is upended when Roy is wrongfully convicted of a crime. Of the book, author Michael Chabon said, "Tayari Jones is blessed with vision to see through to the surprising and devastating truths at the heart of ordinary lives, strength to wrest those truths free, and a gift of language to lay it all out, compelling and clear. That has been true from her very first book, but with An American Marriage that vision, that strength, and that truth-telling voice have found a new level of artistry and power."